Whether you are planning to eat in a Korean restaurant, visit Korea, or cook your own Korean food at home. 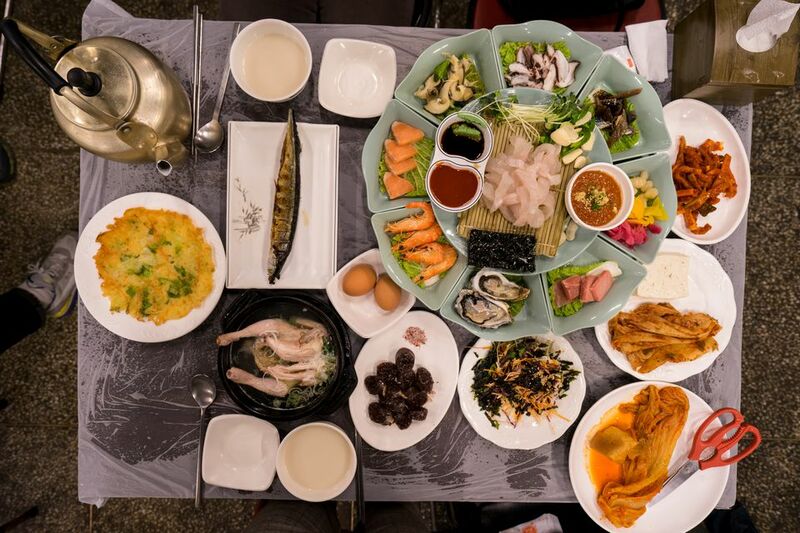 This quick introduction to Korean cuisine will give you all the basics you need. Korean food stands out from other cuisines with the many side dishes (banchan) that are served during meals. The number of side dishes can range anywhere from 2 to 12, but everyday meals feature at least a few. When you eat at a Korean restaurant, your various side dishes will come to you before your meal in small bowls and can be anything from vegetables to meat to seafood prepared in any number of ways. Korean dishes are all served at the same time, so there are no separate courses like in Western cuisines. Rice is the backbone of almost every Korean meal. On rare occasions, noodles will replace the rice, but the vast majority of the time, every person eats a bowl of rice with their meal. Typically, each person will also have their own bowl of soup or stew. The side dishes and main dish or dishes, which can be meat, seafood, or tofu are all be served family-style in the middle of the table. Sometimes, a large stew will replace the main dish and will be served family-style at the table. Koreans have perfected the art of preserving food over thousands of years, so many of the side dishes are pickled, salted, or fermented and many are spicy. Kimchi, Korea's famous spicy cabbage, has over a hundred varieties of different vegetables, including some non-spicy types. Even though Korean stews and soups are served hot (almost boiling), many of the side dishes are served cold or at room temperature. As a result, much of Korean cuisine is intensely flavored, savory, and bold. Everything, including meat and poultry, is cut into bite-sized pieces so there is no need for a knife. Koreans are also adept at using chopsticks so if the meat is too large or a whole grilled fish is served, it can be split with chopsticks. Many Korean meat dishes are braised or marinated for a long time for a tender flesh. Korean food is traditionally eaten with stainless steel chopsticks and a long stainless steel spoon and is traditionally served at a low table with people sitting on the floor. Korean cuisine has been affected by its geography (peninsula), climate (hot, humid summers and very cold winters), proximity to neighbors China and Japan, and the Japanese occupation from 1910 to 1945. European traders also had an impact on the cuisine with the Portuguese introduction of chili peppers to Korea in the 17th century. By the 18th century, chili peppers were already being widely used in the preparation of Korean cuisine. Koreans Eat Dog: Fact or Fiction?